Similarities between ULIP and Mutual Funds. Both ULIPS and Mutual Funds offer options to invest in Equity, Debt and Balanced fund options. Net Asset Value (NAV) concept is applied in both. Value of Investment is measured in terms of units in both cases. Both ULIP and Mutual funds provide investment options for individual investors. ULIP or Unit Linked Insurance Plan is a combination product of INSURANCE and INVESTMENT in a single package. Investment options in ULIP offers more flexibility and choices when compared to the conventional policies. ULIP policy premium will naturally contain following portions in it. Premium to cover the Sum Insured or Insurance Coverage. Premium to be invested in Equity Bonds or other Asset Classes. Mutual Funds pool the amount available for investment from large number of customers. Amount thus pooled is invested in different funds based on the risk appetite of the customers. 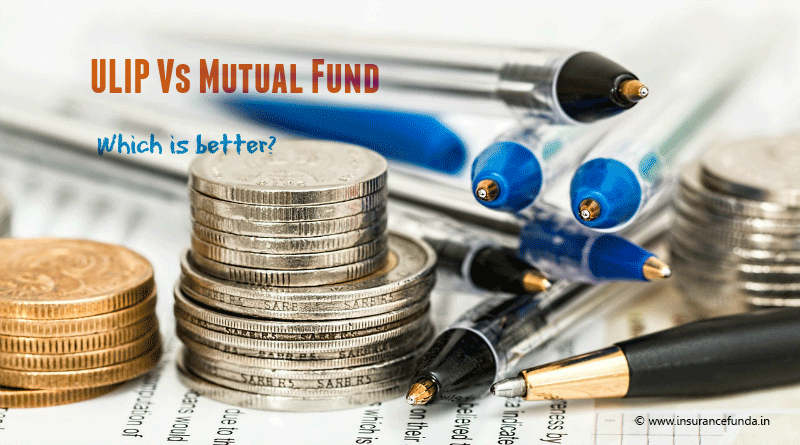 Main difference of Mutual Fund is the absence of insurance coverage when compared to ULIP. So the premium or the investment of Mutual Fund will have only two portions in it. ULIP policies have Insurance coverage as an inbuilt additional benefit and hence the policy will have Mortality Charges included in it. So the amount available for investment will be slightly lower in case of ULIP policies. But generally if the policy holder is young the mortality charge will be low and will not have significant impact in the returns. ULIP plans have Income Tax rebate while paying the premium under section 80C. Maturity and death coverage is also exempted from income tax under section 10(10D) of Income tax act. Mutual Funds generally does not have income tax rebate and only exemption is Equity linked Saving Scheme based funds which also carry income tax rebate for invested amount under section 80C. Thus ULIP policies have a clear advantage compared to Mutual funds while Income Tax rebate is considered. Other factors worth considering includes the Lock In period. Minimum Lock in period of ULIP is fixed as five years for IRDA. Lock in period of Mutual Fund depends on the design of the fund and a customer can select a fund with lower Lock in period if he wants more liquidity. Switching of fund is a great option available in ULIP policies which can be used to multiply the returns, if used properly. Fund switching is done between equity based funds and bond based funds after analysing market fluctuations. Fund Switching techniques for ULIP policies. ULIP plan can be considered to be superior when Income Tax implication is concerned. Insurance Coverage inbuilt in the ULIP plan is desirable if the customer belongs to young age. If liquidity is the main concern then it is better to go for mutual funds without lock in period. ULIP offers an additional option to switch funds to enhance or protect the fund value.